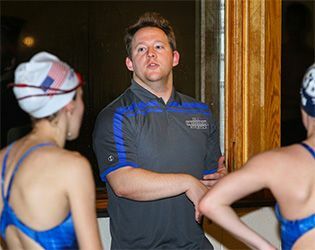 The GSB swim team, led by head coach Nolan Silbernagel and assistant coach Donna Bednarsky, won their first meet of the season on Tuesday by defeating Jonathan Dayton 90-77. The Knights started the meet by taking first in the 200 medley relay with the team of Rebecca Michaels '20, Adrian Massuet '20, Preston Reep '19 and Christian Ernst '19 in 1:58.42 while the relay team of Gabby Breuer '17, Emily Supron '17, Jason Berg '19 and Daniel Shen '19 grabed third place to open the scoring. The Knights never looked back after that race, and were led by first place finishes in the 200 individual medley by Johnathan Osma '20 (2:43.48), Ernst in the 50 freestyle (26.09), Meyers in the 100 freestyle (1:00.86) and 100 breaststroke (1:17.29) and Michaels '20 in the 100 backstroke (1:06.72). The Knights also secured many 2nd, 3rd and 4th place finishes with personal best times to help seal the win. GSB has their last dual meet of the season when they take on Morristown-Beard and Wardlaw-Hartridge on February 2 for Senior Night.